The New York Yankees have once again done what they do better than every other team in the history of professional sports, win. And the Boston Red Sox are back to doing something that for 86 years they did better than every other team in the history of professional sports, blow it. In September, the Red Sox have been 5-18. That includes game one of today’s doubleheader where Tim Wakefield blew the game very early. Before September, it could have been argued that the Red Sox were the best team in MLB. It was just one month ago when the Red Sox had a lead in the AL East and the Yankees were locked to win the Wild Card with the Tampa Bay Rays 7 games back and the Angels out of the talks. Now, the Yankees have won the AL East and the Red Sox are fighting just to get the Wild Card with the Rays and Angels just behind them and the Yankees 9 games ahead in the East. The ERA of the Red Sox for September has been just plain bad. If an article were written on all of the Red Sox pitchers who have done well this month, it would be a blank page. The Rays are a ½ game behind the Red Sox. With game 2 of the Yankees and Red Sox doubleheader today, by tonight, the Red Sox could be on the outside of the playoffs looking in. Fitz and Vig. Real Sports Guys. 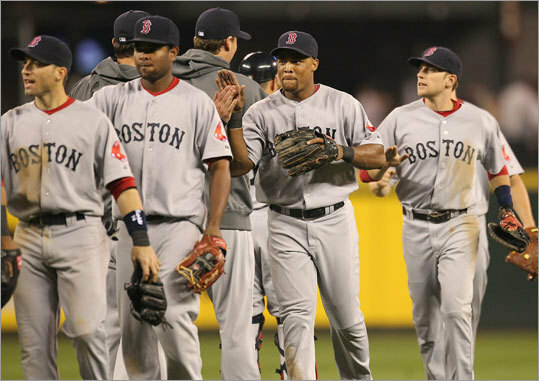 » Boston Red Sox Choking! Epic Collapse! Panic in Beantown!